The greatest event of this week and maybe of the year is 2013 MVP Global Summit. But while our MVPs make history, the new portion of news from this past week is waiting for you =). Steffen Forkmann presented experimental F# 4.0 installer. Interesting white paper from MS Research about F# 3.0 type provider. Video from Keith Battocchi’s “Systems Information Programming Made Simple with the F# WMI Provider sample” talk was shared. Fsharpx 1.7.8 with Microsoft Dynamics CRM type provider is now on NuGet. Screenshot of F# on Xamarin Studio. Xamarin 2.0 reviewed: iOS development finally comes to Visual Studio. Lev Gorodinski wrote “Domain-Driven Design With F# and EventStore“. Filip Ekberg posted “Decompiling .NET Applications“. Daniel Mohl shared materials from “Building Better Web Apps with F#” talk. 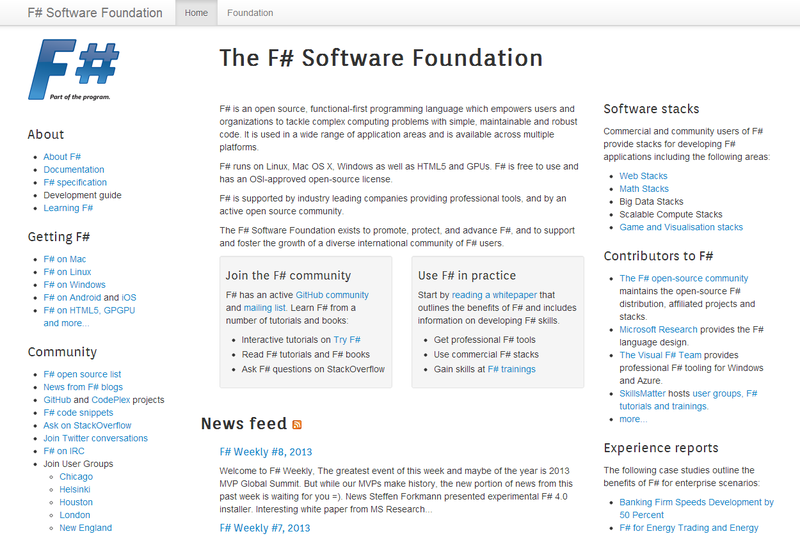 Gaston Hillar blogged “More Information-Rich Programming with F#“. Adil Akhter shared “Collatz Problem a.k.a. 3n+1 Problem“. Phil Trelford posted “Connect All The Things – MVP Summit 2013“. Phil Trelford published “F# Eye For The C# Guy“. Gary Evans wrote “Option pricing in F# using the Explicit Finite Difference method“. Simon Cousins blogged “Does the language you choose make a difference?“. Yan Cui wrote about “AOP – string interning with PostSharp attribute“. Colin Bull presented “F# end to end“. Gustavo Guerra posted “F#, Windows Phone 7 & Visual Studio 2012“. Natural Language Processing is one more hot topic as Machine Learning. For sure, it is extremely important, but poorly developed. Lets start from what we already have. Looks really bad. It is hard to find something that really useful. Actually we have one more option, which is IKVM.NET. With IKVM.NET we should be able to use most of Java-based NLP frameworks. Let’s try to import Stanford Parser to .NET. Read more about what you can do with IKVM.NET. The Stanford NLP Group makes parts of our Natural Language Processing software available to the public. These are statistical NLP toolkits for various major computational linguistics problems. They can be incorporated into applications with human language technology needs. All the software we distribute is written in Java. All recent distributions require Sun/Oracle JDK 1.5+. Distribution packages include components for command-line invocation, jar files, a Java API, and source code. If you need a strongly typed one, then you should do two more steps. No signed stanford-parser.dll is available on GitHub. That’s all! Now we are ready to start playing with Stanford Parser. I want to show up here one of the standard examples(ParserDemo.fs), the second one is available on the GitHub with other sources. What we are doing here? First of all, we instantiate LexicalizedParser and initialize it with englishPCFG.ser.gz model. Then we create two sentences. First is created from already tokenized string(from string array, in this sample). The second one is created from the string using PTBTokenizer. After that we create lexical parser that is trained on the Penn Treebank corpus. Finally, we are parsing our sentences using this parser. Result output can be found below. I want to mention one more time, that full source code is available at the fsharp-stanford-nlp-samples GitHub repository. Feel free to use and extend it.